Welcome to the RunnerDude 1000 Mile Club! Your goal is to log 1000 miles between January 1, 2019 and January 1, 2020! These are your miles. You can run, walk, or run and walk your miles. These can be inside, outside, or inside and outside miles. Runners (and walkers) are awesome people and as such we’re using the honor system. You can choose to log your miles however you’d like. You can go old-school and record your miles on a wall calendar or you can use a fancy app. Club members have acces to a private Facebook group page to motivate one another and to celebrate their milestones. Post a picture when you reach your first 100 miles in your year-long challenge. Post a picture of soggy you when you run in that downpour cause you had to get in your miles. Post when you compete that race you’ve been wanting to run. Post a picture when you PR in a race during the next 12 months. 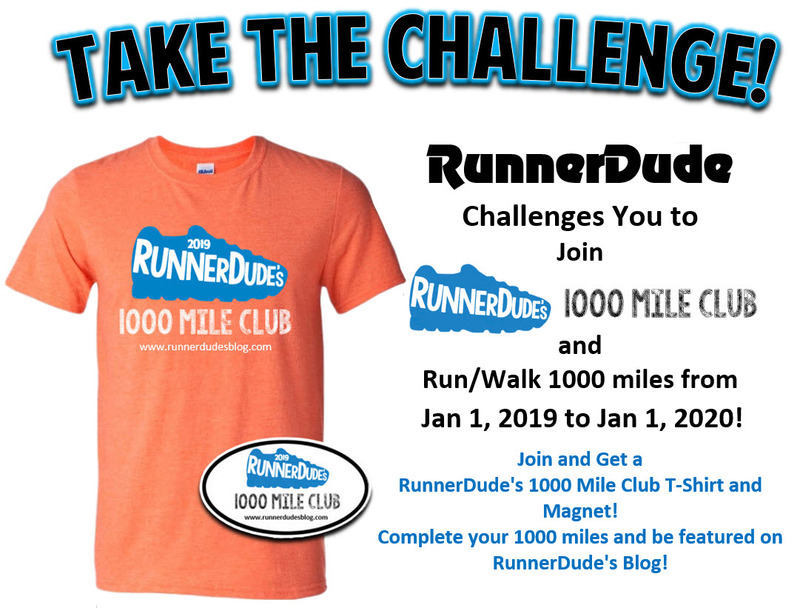 All club members reaching their 1000-mile goal will be featured on the award winning RunnerDude’s Blog in January 2020! In 2018 we had 8 states represented in the club (NC, SC, GA, FL, OH, MO, NE, NY)! Let’s shoot for all 50 in 2019! WeeDoggie! You’re going to do amazing things over the next year. Awesome news! 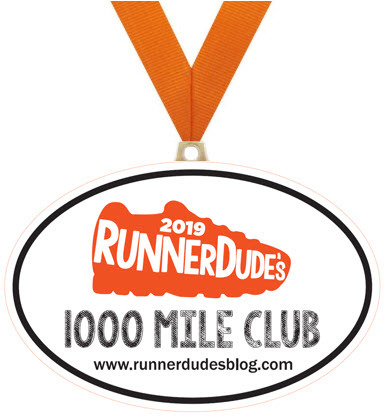 Junction 311 Endurance Sports has partnered with RunnerDude’s Fitness and will be providing special RunnerDude’s 1000 Mile Club medals to all members reaching their 1000miles durin 2019! WeeDoggie! So, all club members get the t-shirt and magnet and those reaching their 1000 miles now will receive this awesome medal! And don’t forget, those runners that reach 1500 miles will receive a mystery bonus! (Actual medal design may vary.) I’ve extended registration until Feb 3rd (my birthday!). Cost for New Club Members: $40 (includes membership, T-shirt and magnet) T-Shirts are Unisex sized and are semi-fitted 65% Poly/35% Cotton. We now have over 100 members! Join Us! After registering, RunnerDude will email you with more specific information about the club. T-shirts and magnets will be shipped or ready for pickup in mid to late February. You can wear your T-shirt during the year to keep you motivated, or you can wait and wear it once you’ve completed your miles! Once a member, you can join the Strava RunnerDude’s 1000 Mile Club too!